The content is split into two Elastik soundbanks. These provide dry or FX versions of the loops, allowing you to install either or both as you prefer. The dry versions allow you to choose your own ambience treatments while the FX versions include some cool reverb and delay options and are ready to mix straight out of the box. The phrases are four bars long. In both soundbanks, the content is organized into tempo-based folders spanning 90 to 120bpm. Each tempo category includes loops with root notes in both E and A. This, alongside Elastik’s powerful pitch/tempo shifting capability, and the cutting-edge Retune features, means it is easy to build complete, song-based, guitar performances. 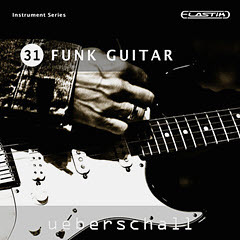 As part of the Elastik Instrument Series, Funk Guitar provides over 1000 loops across 2.5GB of sample content and makes an excellent complement to our other funk and soul-inspired libraries such as Funk Up, Funk & Soul or 70s Funk Rock, giving you even more fresh and funky options. The Elastik player allows adapting the loops to your current song project in speed, scale and pitch. This way, not only loops from Funk Guitar but from all installed Elastik libraries can be combined freely. With functions such as resample, formant and reverse as well as an effective multi mode filter, samples can be easily modified and alienated.